Refractors are the longest, heaviest and most expensive to produce of the common amateur telescope designs. Achromatic refractors, the most common and affordable type, use two element objectives made from crown and flint glass that are unable to focus all three primary colors of light (blue, green and red) to the same point. The result is that they make a pretty good stab at focusing red and blue light, the two ends of the visible spectrum, but green light is slightly out of focus, creating those annoying little haloes around bright objects like, say, the planets these telescopes are supposed to be good at viewing. Even so, achromatic refractors typically cost more, often substantially more, than Newtonian reflectors or catadioptric telescopes of equal aperture that don't have color fringing problems. What a deal! High end ED doublet and APO triplet refractors solve the color-fringing problem (at great expense) and appeal to the Cool-Aid drinkers with more money than sense. As status symbols, they reign supreme among amateur telescopes, but how much can you actually see with them? 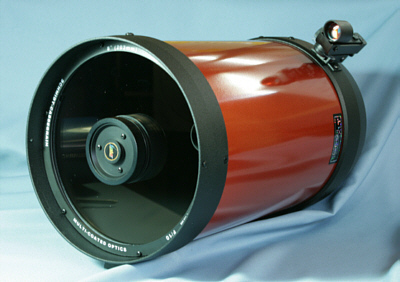 For example, a Stellarvue SV115T (4.5" APO triplet, 800mm focal length) optical tube assembly (OTA) costs $3195 in 2010 dollars. A Celestron C6 (6" SCT, 1500mm focal length) OTA provides approximately the same visual capability and the C6-A-XLT lists for $549 direct from Celestron. We have used these two telescopes side by side, so I know this is a valid comparison. The C6 is 16" long and weighs 10 pounds, while the SV115T is 21.5" long and weighs 13 pounds. Guess which telescope is easier to transport and handle? Okay, you're probably thinking, but how about planetary viewing, for which high-end refractors are famous? Maybe long focal length APO refractors have a place for those who use their telescopes only to view the few planets on which we can see surface detail. Unfortunately, such scopes are few and far between, since most APO refractors today have short focal lengths for increased portability. In any case, planetary applications are limited. I mean, think about it. In our solar system, only the Sun, Moon, Mars, Jupiter and Saturn provide any visible surface detail. Venus and Mercury are inside the earth's orbit and go through phases like our moon, but that's it from the standpoint of the amateur astronomer with a portable telescope up to, say, eight inches in clear aperture. (Know anyone with a refractor larger than eight inches?) The outer planets (Uranus, Neptune and Pluto) are too far away to observe through portable refractors; they are visible only as distant specks. After you tire of examining those five bodies in our solar system, what's next? There are thousands of deep sky objects that will entertain you for life, but guess what? Dollar for dollar, a catadioptric or Newtonian reflector telescope will always outperform even the finest refractor, because you get so much more aperture for your money. Aperture rules! A Celestron C8-A-XLT optical tube (8" aperture, 2032mm focal length) carries a 2010 MSRP of $889 and gathers about 843 times more light than the unaided human eye. (It is also physically shorter and lighter than an SV115T and fits on the same mounts.) The aforementioned SV115T gathers only 270 times more light than the human eye. There is no question that a C8 will easily outperform any 4.5" refractor for deep sky observing and amateur astronomers generally spend the majority of their time observing distant nebulas, galaxies, star clusters and the like. The C8, due to its long focal length, is also excellent for planetary viewing. Leaving cost aside, which is hard to do when comparing an APO refractor, for most observers the C8 will simply do a better all-around job. I rest my case. Back to Astronomy and Photography Online. Copyright 2010, 2016 by chuckhawks.com. All rights reserved.